First performed on Broadway in 1948, Kiss Me Kate, the musical revolving around a turbulent production of Shakespeare’s The Taming of the Shrew, has become much-loved piece of theatre, enjoying successful Broadway and West End revivals. This Christmas it’s coming to Sheffield for a month-long run at The Crucible Theatre (7th Dec – 12th Jan). 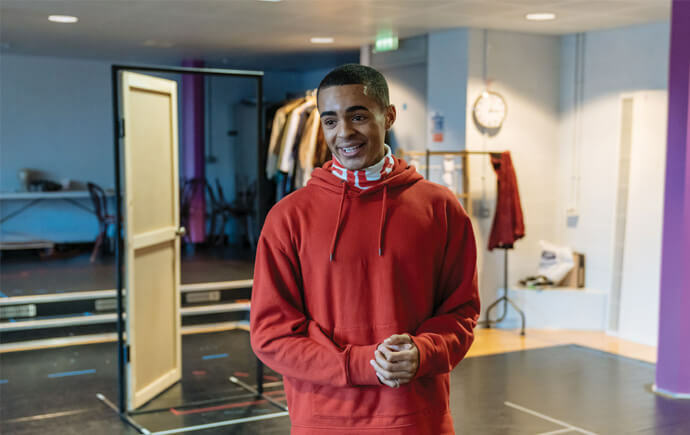 In preparation for the start of the show’s run, Exposed caught up with two of the show’s stars, Rebecca Lock and Layton Williams. Have you been to Sheffield before? I was here five years ago in the production of Oliver. I loved it, and coming back here now, doing this show, has made me realise how much I had a lovely time when I was in Sheffield. I love the place, I love the theatre, I love everyone who works here and it’s such a great place to be. 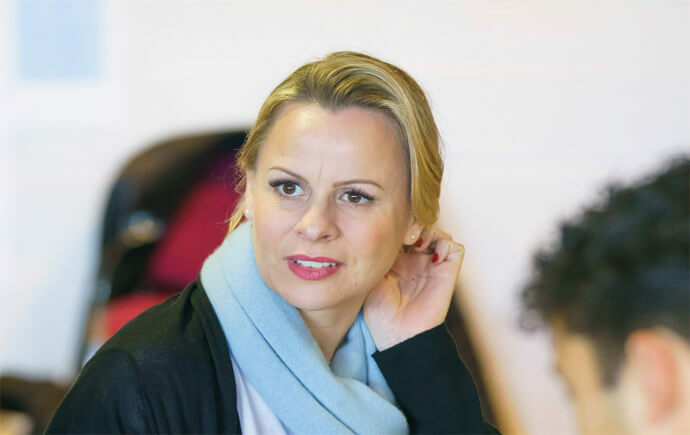 So why did you want to be involved in Kiss Me, Kate? Because it’s such a brilliant piece of theatre. It has the magic of the old movies, you know the 1940s movies, you think of people like Rita Heywood and Catherine Hepburn, Jean Kelly and it’s the magic of those musicals. This show is the heart of that because it’s set in 1948 so it has that magic. And, this Kate/Lilli is probably one of the most sought after parts for women of my age. You know, you hit forty and you’re like “okay, where are the good parts! ?” and this is one I’ve always had my eye on because it has everything; it’s funny, its dramatic, its emotional, she’s in love with somebody and then she hates the person. Its hugely tempestuous, but she seems the most wonderful woman and she gets to do a bit of everything. How is it playing two characters within one musical? Yeah. Yeah, I mean Lilli’s very similar, they’re kind of on parallel journeys. So, there’s not much of a divide? There is a divide. They have qualities, similar qualities, they have a short temper, they both strong women. Did you find it challenging portraying both characters? I think its handled very well actually, Paul Foster who’s directed it, is very very clever. The way the show is designed is it’s going to sit in this theatre and it’s going to be obvious when it’s the play within a play and when it’s not. I think, a lot of the time they’re going to show the workings of the theatre, so rather than having people come on stage, and having space you as an audience never see, you get to see it all. You get to see the crew men flying in on a piece of set, which is incredible. What makes the struggles of the characters in this musical relatable? Well, everyone’s fallen in love, everyone’s had their heart broken, everyone sings a song in the shower, we all love music. It has something for everybody in this show. It’s very funny and the writing, even though it was written in the 40s, it’s very clever and very now and funny and quick. And in the way it’s been directed, it’s very 2018 Kiss Me Kate. It’s not stuck in the past. It’s all very relevant now. Tell us about the challenges Lilli faces. It’s about how much she’s in love with this guy who she has been previously married to, and they got divorced. They’re very hot tempered people, very passionate actors. It’s that age-old thing of being absolutely in love with somebody but also hating their guts, and that is her journey throughout the whole thing, you know, what’s going to happen. I’m not going to tell you what happens though! Who in particular will enjoy this play? I think everyone should come and see it. It does have something for everybody. It’s going to look beautiful, it’s got incredible dancing, the most beautiful girls, kicking all the legs, which I wish I could do. Its packed with people from the West End, you know, Edward (Baker-Duly) has come from Broadway. The talent is incredible, I think the design and everything in this theatre is going to be bonkers! It’s going to be breathtaking. It’s got a brilliant writer Cole Porter, and composer, where everybody will recognise something in it. I have, this is probably maybe my third or fourth time. I did Hairspray here, just over at the Lyceum. I’ve been here a few times, I feel like I know the streets, it’s nice to be back! Great to have you! So why did you want to be in this production? Well, I’ve never done a legit show before, and by legit, I mean one that’s set back in the 1940s. But it’s just nice to do something different. Because the latest one I did was Hairspray, which was kind of pop, and this one is really taking it back. So, this like another string in a different bow. My character, Paul, is a dresser, and one of the lead characters, and you wouldn’t think he’s going to be cracking out this big number. But come Act 2, it’s the first time you see a performance that’s just relaxed, and just for the characters. Paul leads Too Darn Hot, the number in the second act, and it’s nine minutes long. Wow, is it hard to sing? It’s not hard to sing but for singing that long it’s kind of… stamina. And so it’s really nice to have that kind of free, dance-heavy, massive four-minute dance break and performing the song; I think it’s literally nine minutes in total. That’s probably my favourite part of the show. What’re your character’s biggest challenges? Probably getting through Too Darn Hot without fainting. Is that your character or you? Kiss Me Kate will be showing from Dec 7 – Jan 12. Tickets can be purchased from the Crucible Theatre website: www.sheffieldtheatres.co.uk/whats-on/kiss-me-kate.